Canada's helicopter deal may be on the rocks, but concerns about human rights abuses in the Philippines remain. 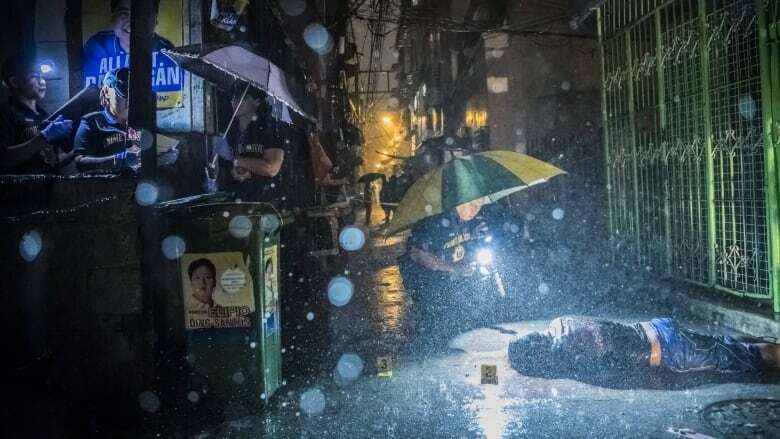 Daniel Berehulak is a photojournalist who won a Pulitzer for his photos documenting extrajudicial killings under President Duterte. 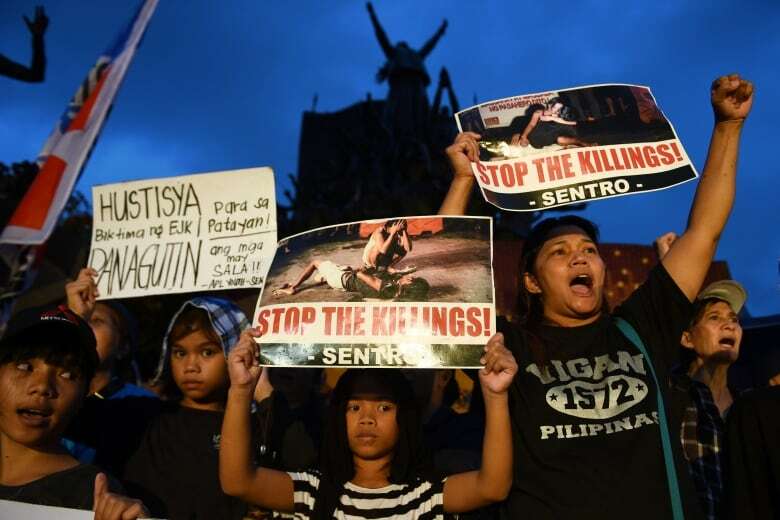 On the streets in Manila, the killings come with nightfall. Gunmen wheel by on motorcycles, blasting their target, leaving bodies in the street. A gang of masked men handcuffs a civilian and shoots him dead. Moments before, he was playing a video game with his nephew. The bodies pile up in morgues and on the street, hands tied behind their backs, their faces wrapped in tape. They've been executed, sometimes in their own homes, often as their families watched in horror. These stories come to us through the photos of Daniel Berehulak. 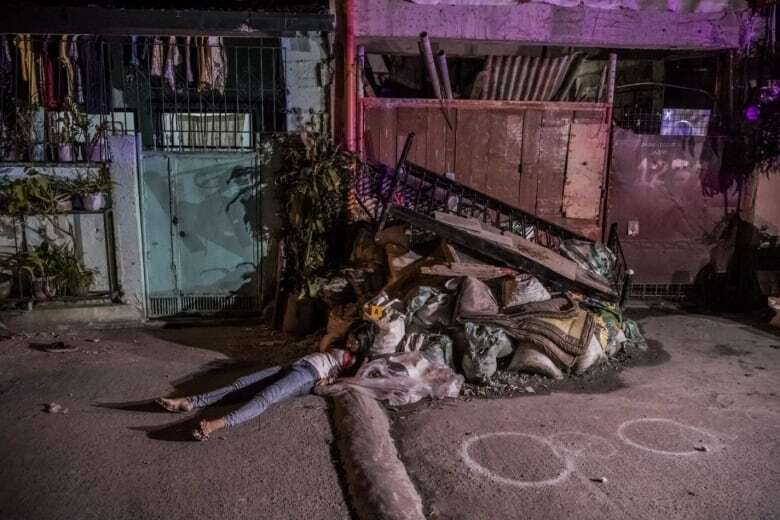 Nightly, in Manila's poorest neighbourhoods, he raced to gather evidence of the latest slaughter in the killing spree inspired by President Rodrigo Duterte's war on drugs. "As we would approach, you would hear the screams and the cries of the family members," Berehulak tells me on Day 6. On assignment in 2016, Berehulak photographed 41 murder scenes. He says you hear the grief and terror before you arrive at the site. "It wasn't the crime scene that was the most shocking on that night, because as we got there, they cleaned up the scene, but it was just the shrieks and the pain that you could you could hear, echoing down the street." Before Rodrigo Duterte was elected to lead the Philippines he expressed a fondness for extrajudicial violence. He campaigned on eliminating drugs and killing criminals, and he won in a landslide. Since his election thousands have been butchered. Berehulak was in Manila for 35 days in the fall of 2016. During that period there were 24 killings a night. He says you cannot disconnect Duterte's words from the rampant violence. "All the rhetoric that you heard from him — saying he was happy to slaughter millions, that if he had enough bullets he'd be able to do it himself — all the words that he was saying were mimicked in the streets. And this was happening on a daily basis when we were there." 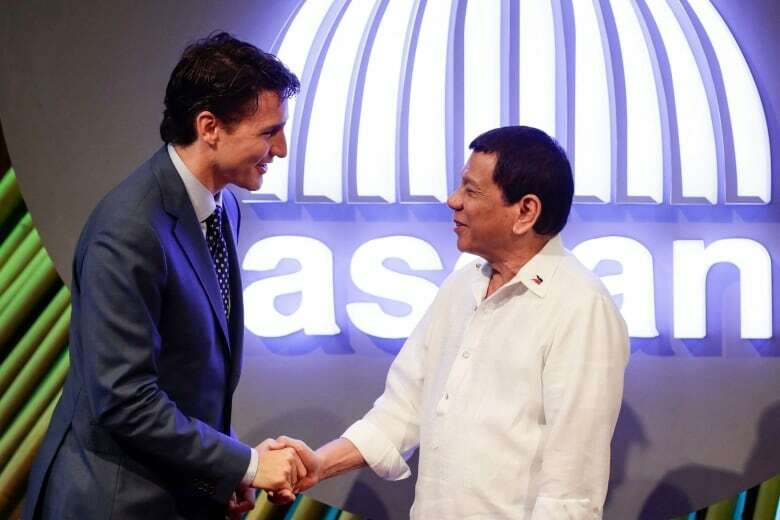 This week, as questions over human rights loomed, Canada pulled back from a deal to sell 16 helicopters to Duterte's government. The Canadian government is reviewing the contract. Duterte says he cannot allow conditions to be placed on how the helicopters will be used, so now he intends to cancel the order. 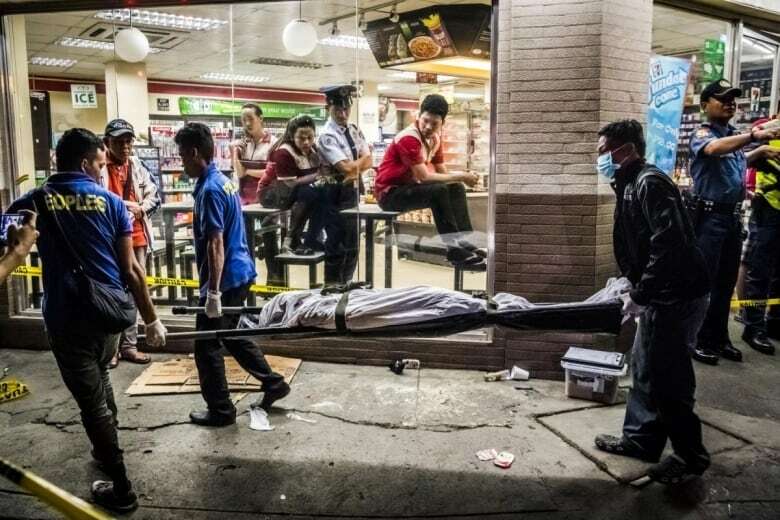 Also this week, the International Criminal Court announced it is investigating Duterte's purge as a possible crime against humanity, but Duterte shows no signs of ramping down his war on drugs. Earlier this month he relaunched the campaign. Duterte was elected as a champion of the poor, but Amnesty International says his war on drugs has overwhelmingly affected people in poverty. "I would say it's more of a war on class, it's more a war on the poor — [not] necessarily on drugs," Berehulak says. He claims there's evidence people are using the drug war to settle other scores. "There have been reports about lists that have been put together by local leaders basically giving the locations of certain people. And the thing is, when there's a breakdown of justice and no follow up, I mean anyone can … if you had a fall-out with a neighbour or something like that, this is the time to be able to follow through with it." 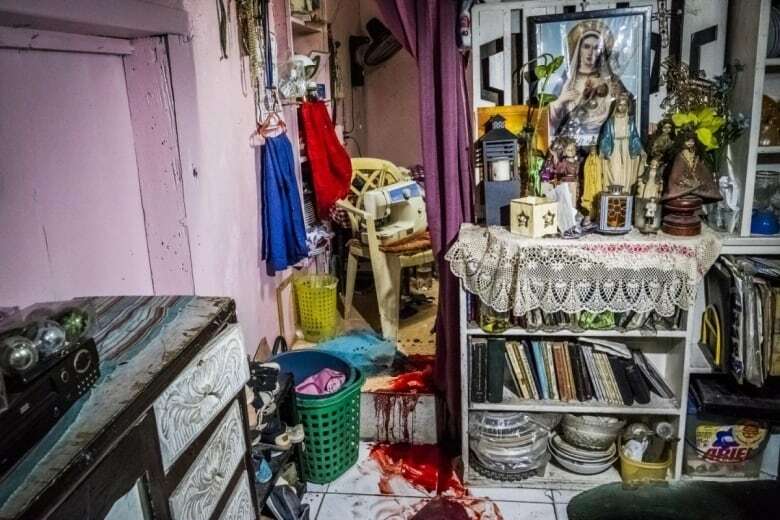 An image from Berehulak's essay: a crowded living room, a homemade altar stained with blood. This was the home of a 34-year-old man police said was firing on them as they entered. His family says he was fixing a transistor radio when he was killed. Berehulak says the police routinely plead that they were defending themselves against unarmed civilians. "We had the same defense from the police and then we heard the families telling us — an eyewitness telling us — that they cleared out the streets and then they dragged, you know, so many of the victims down an alleyway and … killed them in cold blood." "It was being perpetrated by police, saying that they were acting in self-defence," Berehulak says. The name of Berehulak's photo essay, They Are Slaughtering Us Like Animals, comes from something Berehulak heard a person say as he was leaving a crime scene. "One of the residents who we stopped to chat to was telling us how people were so afraid in the streets and that, 'They were killing us like chickens and they were slaughtering us like animals.'" Berehulak says 'they' refers to the police. They Are Slaughtering Us Like Animals won Berehulak his second Pulitzer Prize. I asked him which images are still fresh in his mind. "One of the images that probably haunts me the most is of a young girl called Jimji," he says. She's six. 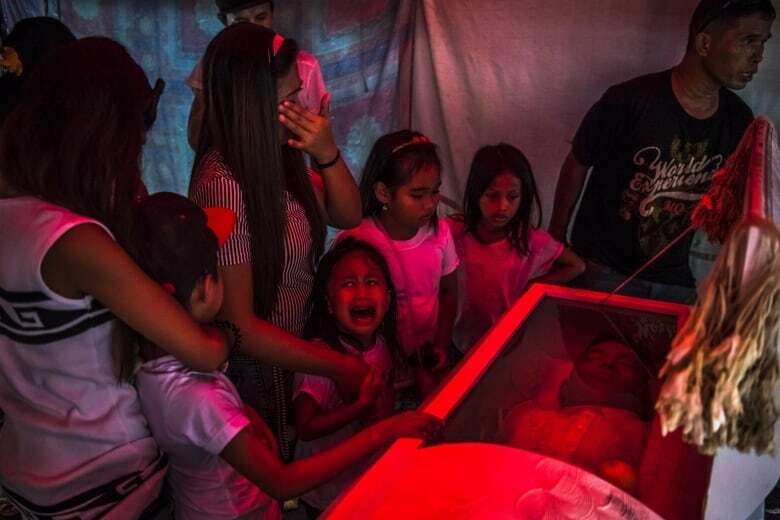 Her father Jimboy Bolasa, 25, is seen in Berehulak's photo lying in his coffin. "He was taken from in front of his house by people with masks on, in broad daylight, in mid-afternoon, in front of his family," Berehulak recalls. Later that afternoon he was found dead. Children are gathered around the corpse, solemn faced except for Jimji. "One of the relatives is holding her back," Berehulak says, "and she's screaming in anguish 'Papa! Papa!' as the funeral workers are about to take the casket away." To hear our full interview with Daniel Berehulak, download our podcast or click 'Listen' at the top of this page. Wong Bangers and daffy stands: Whatever happened to ski ballet?